When it comes to online game chat, the EX-03 is a natural gaming partner. Lightweight in design with a comfortable wired rubber earhook, Next Gen Bluetooth chipset and a noise cancelling speaker enabling you to focus on your game in comfort. Like all of our products, the EX-03 follows one important rule: form follows function, the body is designed with comfort as a priority, Next Gen Bluetooth Chipset has been utilized for clarity of voice and improved over standard with a sound chamber design producing a fuller sound overall. Pairing/charge LED indication: Visual indication of pairing & charge status through the use of a breathing LED. Also easy view status for power mode on/off. Flexible earhooks & microphone: Comfortable, flexible earhooks & microphone, just adjust your headset for a comfortable fit. Voice & game at your fingertips: The EX-03's game/voice balance control allows you to tailor how much voice you want to hear relative to the game's sound effects. In-ear rubber cushions: Supplied with additional shapes, sizes and softness for a perfect custom fit, The ear buds sit comfortably in the ear canal reducing external ambient noise. Sound chamber: Large sound chamber for a fuller sound. 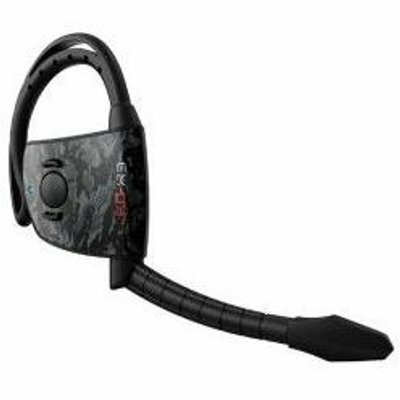 Military styling: Rubber coated body for comfortable contact with the ear, topped with a midnight digital camo fascia. Noise cancelling mic: Microphone shell designed for clear and distinct voice communication, eliminating echo and external noise. Rechargeable battery: 77 Hours+ continuous game time, rechargeable via micro USB connector.